I can clearly recall our first ranked match. I said to you hello and good luck and you did not respond. I found that a bit impolite. Then I was winning and you started lottoing and I just wrote "Bravo for the lotto". I admit it was your right to do so, but you cannot exactly blame me for being rude, I did not call you any names or anything. About the same happened when we met again, I told you hello and gl but you didn t say anything. If I insulted you and that s why you didn t want to talk to me I am sorry (really), I did not intend to do so. There is about 0,1% chance (gotta ask our betting man Toby about that) the prize is actually rewarded, but in your chance it's absolutely 0 to show on your bank account as you already have 5 wrongs while you may have none !! I haven't actually checked, but I'm assuming you're basing this on a uniform probability distribution across players? I think any reasonable model cuts down on the number of realistic options significantly - my model for example only allows for 720 possible combinations for the winning 5. I don't have a rigorously accurate confidence interval around that but I'd say around 80%. Assuming everyone's guesses fall in a 'realistic results' bucket of approximately that size, then the chances of payout I suppose would be 5-10%, assuming we get around 40 guesses for each ticket. (80% that we do have 'realistic' results * (40 guesses / 720 options) * 2 tickets). There are some inaccurate assumptions there, like that I overshot the probability of realistic results by saying 80% when I should have separately calculated the 4 cases (64% both realistic, 32% one of the two results is realistic, 4% both are not realistic), or that people all have different guesses and such, but roughly speaking I think 5% should be a decent approximation. Also - regarding the '5 wrongs' - I wasn't sure if you meant because I put the same guesses for T1 and T2, but my understanding was that we only need to get 1 ticket correct to win the prize - please correct me if that's not the case! Edited by despy, 08 July 2017 - 07:09 PM. Edited by Unladen Swallow, 08 July 2017 - 07:56 PM. Edited by Jakehaar, 09 July 2017 - 09:10 AM. One can always adjust his tickets ofcourse. I suggest we maintain that possibility up until the former last day of Pyramids . According to the results some adjusting is needed although most do very good, like my Major Nelson (despite of that last royal defeat that is). TBC= to be confirmed. I guess you mean constrictor. Yes, you're coming into my picture too. Win another game and I'll change my tickets again ! I'll do so with whomever . 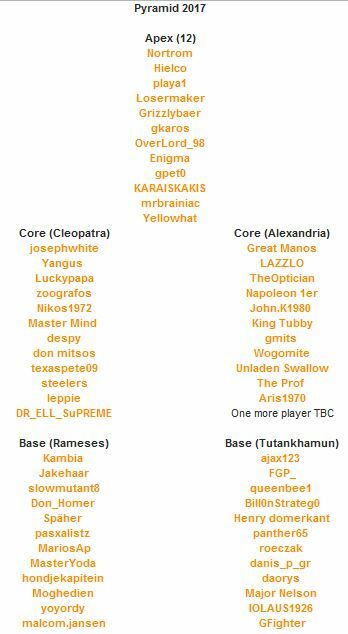 And TBC is still listed in the list... it used to be me actually, but TC hasn't changed TBC yet so it might be a Black swan too. Next week I ll probably play against roeczak. I guess the outcome of the match is going to affect predictions a lot. Edited by Major Nelson, 11 July 2017 - 10:51 AM. 1. You may only pick 5 names on each ticket, You may only enter one ticket of each type. The sponsors of the Pyramid Lotteryhave brought the deadline forward to submit tickets. It is now Friday July 14th 23.59GMT! Ill update the old link in this thread. Just over 24 hours remain until the deadline for Lottery Tickets. Don't miss out on this fabulous chance to win a small fortune.